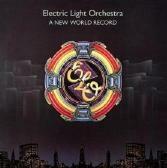 Electric Light Orchestra were nothing if not masters of symphonic melody and "A New World Record" contains ample evidence of such. Just try and resist the hook heavy choruses of "Telephone Line," "So Fine," "Livin' Thing" or "Do Ya" (even if it is a virtual note-for-note remake of The Move's classic). But there's much more than melody awaiting you on this newly re-mastered CD. First and foremost, you get the band's trademark high quality production and musicianship, both sounding much clearer and crisper thanks to the re-mastering. Although ELO probably didn't take as many chances here as they may have in previous records, there's still a lot of interesting music on "A New World Record," including some musical ideas that work and some that don't (an example of those that don't are the fluttery vocal filter and the out-of-place Pac-Man music on "Mission: A World Record" -- maybe it sounded cool then; it dates the song badly today). Thankfully, the ideas that work far outweigh the ones that don't. Also featured on this re-master are five bonus tracks, mostly alternate and instrumental takes of songs featured on the CD and all mostly noteworthy just for historical purposes. Fans of Electric Light Orchestra will definitely want to add this to their collection for the fresh re-master and the bonus tracks, while those just slightly familiar with the band should be pleased with the number of hits found here. Electric Light Orchestra: Jeff Lynne, Bev Bevan, Hugh McDowell, Mik Kaminski, Melvyn Gale, Richard Tandy, Kelly Groucutt. For more information, check out http://www.elomusic.com.